The destructive power of "HOT CLOUD" / NUEES ARDENTES or what is locally called "wedhus Gembel"is hard to be predicted. Latest "Wedhus Gembel"of volcano Merapi's explosion 2006 buried some buildings at Kali Adem area or what is locally popular called Bebeng area, also destroid a "safe chamber" which was specially constructed by expert for escaping in case of explosion of the volcano. The escaping chamber which is also popularly called as " Bunker" in fact could not hold or block the danger of "Wethus Gembel" on Southern slope of Volcano Merapi.A member of rescue team striving to avoid the danger by escaping to the "Bunker" for safe finally his body found by his partners (The rescue Team) without soul in "Bunker". This case shows how powerful the "Wedhus Gembel" was. This posting specially created to understand Pyroclastic phenomenon specially Pyroclastic of Merapi Volcano.How ever, Pyroclastic phenomenon of other volcanoes could be mentioned here as comparative for deeper insight of Volcano Hazard in Indonesia,the home land of land volcano. Indonesian called Pyroclastic or Nuees ardentes as Awan Panas, this is volcanic flowage phenomenon involving various proportions of volcanic gas and fragmented volcanic materials such ashes and rocks in various size collectively moving down volcano flanks in very rush ( approx 50 - 100 km/hr ) and high temperatur (Average 300 - 500 C, closer to eruption center the higher the temperature will be,e.g Agung volcano eruption 1963, pyroclastic temperature 900 c near by summit). Other terms of Pyroclastic or Nuees ardentes is Glowing Cloud.In Indonesia,it also named Hot Coud ( popularly named by most Indonesia ), and specifically named "Wedhus Gembel" by local people living around Merapi volcano Yogyakarta & Central Java.It locally named Wedhus Gembel ( Sheep Feather ) since it seen look like sheep feather in the distance. According to Neuman van Padang (: Nuees ardente is an avalanche of heavy lava block rich in gases, which rushes down the slope of a volcano.During this event the blocks are pulverised and the gases escape explosively.While Bullard (1972) defines a Nuees ardente as a highly heated gas so charged with incandescant ash particles that it resembles a mobile emulsion yet dense enough to maintain contact with the surface as it rushes down the slope of the mountain in hurrian forces. 2.Awan Panas Guguran ( Pyroclastic Avalanch): Pyroclastic avalanche is generated from avalanche of lava dome on summit area of a volcano.Due to it's unstable position on steep terrain, it then collapsed and slide down.It's mobility tends to follow direction of crater crack, and then on lower area it able to spread like a generated turbulence (like fan blow) or turn according to topography condition of the area.So it's further mobility is topographical controlled,depend on actual landscape feature of the area.This pyroclastic avalanche was previously often occurred at volcano Merapi,made it more wellknown as Merapi Pyroclastic type. 1. Aliran Awan Panas / Pyroclastic Flows:This type is generally gravity control , so it move down the flank of volcano , follow valley of the river until it's flowage energy was completely over then stop. Consequently, the Ladu ( pyroclastic deposit) will accumulates inside the river valley and many of them are thicker fragmented volcanic material,in contrary the Ladu in the distance ridge of hill are thinner and softer fragmented. 2.Semburan Awan Panas / Pyroclastic Surges: This mainly consist of grained thinner fragmented volcanic materials and gas.It moves down volcano flank and able to cross ridge of hill surgely. It's Ladu much thinner and broader than Ladu of pyroclastic flow. On eruption phase,either pyrocrastic flow or pyroclastic surge both are able to spread in to any directions. 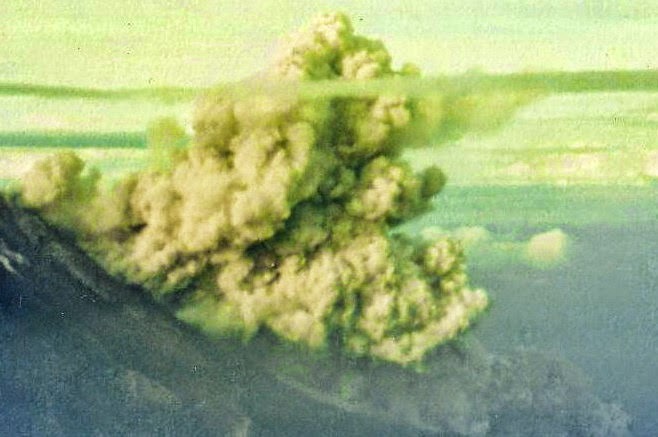 Reachable distance by pyroclastic is vary in many cases of one to other volcanoes as indicated by pyroclastic of Sinabung,Agung and Merapi volcanoes. 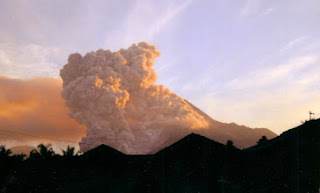 At Agung volcano,during eruption in 1963, Pyroclastic was able to reach distance as far as 5 km, while temperature approx 900 C near by summit.At Merapi volcano, during eruptions 2010,on 5 November, smashing lava dome generated pyroclastic density curren moving down in rush as far as 15 km from summit Merapi in to direction of Gendol River.While at Sinabung volcano, on February 9, 2015, eruption of Sinabung was accompanied by nuée ardente too,it moved down very quick as far as 3,000 meters. Down: pyroclastic Merapi flow down get closer to hamlet of southern slope of Merapi volcano.Captured from southern flank Merapi. Images By :Ambo Upe Olenk & Yanto Turgo. 1.G.Merapi & Kecintaan Alam, Sutikno Bronto. 4.Merapi Trekking Notes 2006,Ambo Upe.